If you woke up at around 8 am or so this morning, you probably would’ve guessed the rain gauge was either dry or a little bit wet, but we had quite the downpour of rain early this morning. I wish I saved a snap shot of the radar image at 5:30 am because there were oranges and reds all over Kitsap. The official rain total as of 3 PM is 0.17”, and most of that occurred before the sun came up. Other than dodging the beastly rain drops this morning, today ended up being partly sunny and mild. For the past few days I’ve been alluding to a big change in the weather pattern sometime between Thursday and Sunday. I’m still anticipating this change, but so far models have been shifting a lot of Thursday’s cold air to the east, boosting high temperatures and scouring out any potential for lowland snow. However, a new wrinkle has entered the forecast for this weekend which looks pretty dry but unseasonably cold. Granted this batch of cold air doesn’t slide off to the east like Thursday’s is pegged to do, we could be looking at a very cold weekend and whatever moisture falls could be in the form of snow or rain and snow. How cold are we talking? Right now it’s looking like a moderate push of colder air, but we’ll know A LOT more about this event in the next few days. 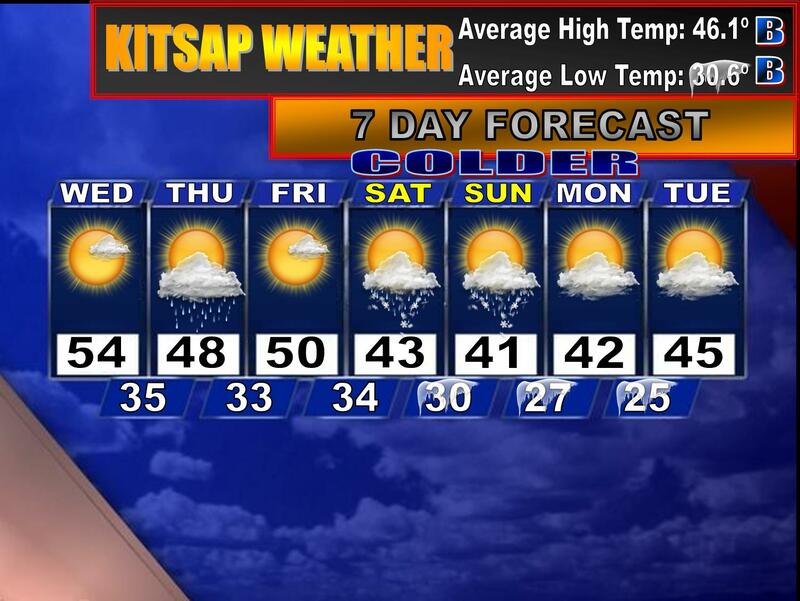 Extreme cold is very rare for Western Washington this late in the season, but it is known to happen. I gathered some information on past March cold outbreaks and let me tell you…it’s pretty intriguing! Take March 1989 for example which featured both big cold and snow for the Seattle area on the 1st and 2nd of the month. High temperatures were in the mid and upper 30s with lows solidly in the 20s. Although less significant, March 1960 featured highs in the 30s with some snow from the 1st through the 4th of the month. Lows were impressively all in the 20s. Bottom line, some pretty impressive March cold could be in store for this weekend. There are still many uncertainties as some models have been edging this weekend’s potential cold blast a bit to the east. That doesn’t mean we’re out of the woods, it just means models have not exactly converged on a solution yet. In the short term, enjoy the mild and dry weather!